La Paille Basse propose different mobil homes and pitches to answer all the wishes of his holiday-maker. Campsite : The Domaine de la Paille Basse offers you many different pitches respecting the natural surroundings. Shaded or sunny, on grass or castine, isolated or close to all facilities… our team will try to please you. SIMPLE pitch : Pitch + 2 Persons + 1 or 2 tents or a small caravan. Pitch with ELECTRICITY : Pitch + 2 Persons + 1 or 2 tents or 1 caravan + Electricity (10 amps ). PREMIUM pitch : Large Pitch + 2 Persons + 1 or 2 tents or 1 caravan + Electricity (10 amps) + Water and drainage +Table and chairs for 6 persons + 2 long chairs + Fridge + BBQ +1h Wifi/day. Premium Mobil-home PREMIUM 6/8pers:40m²,1 bedroom with large double bed (160*200), 1 bedroom with 2 twins beds, 1 bedroom with 2 twins beds which 1 pullout, 1 convertible in the living room. MOST:2 bathrooms, 1 terrace 20m²,1 safe, sheets included, free internet connection. Rentals : In the heart of woodland, all mobile homes have modern equipment. 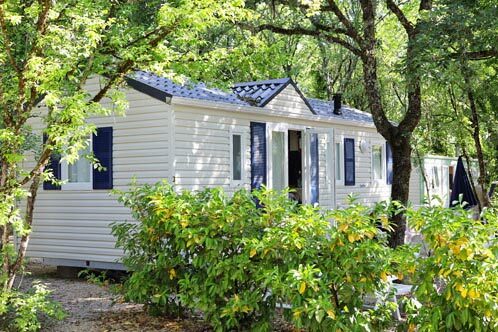 For a week-end or a longer stay, the mobile home offers comfort and independence. There are 4 types of mobile homes : 2 or 3 bedrooms - from 4 to 6 persons. Mobil homes 60 completely equipped Mobile homes (dishes, refrigerator freezer, micro wave, coffeepot, outside garden furniture, parasol and BBQ). Mobil-home COSY 4pers:22m², 1 bedroom with double beds, 1 bedroom with 2 beds twins. Mobil-home LOUNGE 5/6pers:27m², 1 bedroom with double bed,1 bedroom with 3 single beds, 1 convertible 2 pers in the living room. Type 1 : 1 bedroom with a large double bed(160*200),1 bedroom with bunk beds,1 bedroom with 2 beds twins. Type 2:1 bedroom with double bed and 2 bedrooms with 2 twins beds. Mobil-home PREMIUM 6/8pers:40m²,1 bedroom with large double bed (160*200), 1 bedroom with 2 twins beds, 1 bedroom with 2 twins beds which 1 pullout, 1 convertible in the living room.